The Wealden Times Fair is a firm favourite for the Burlanes team and the Midsummer Fair is the third time we've been part of this fabulous event held at Hole Park, Kent 5-7 June. A festival of Craft, Cooking & Cultivation! Come along and be wowed by cookery demonstrations, gardening talks and craft workshops. We will be there before and after the daily cooking demonstrations. 9-10.30am and 3.45 - 4.30pm. Join us for a glass of bucks fizz and guided tour of the beautiful bespoke Chefs' Theatre kitchen we have created for the Sew, Grow, Eat festival. 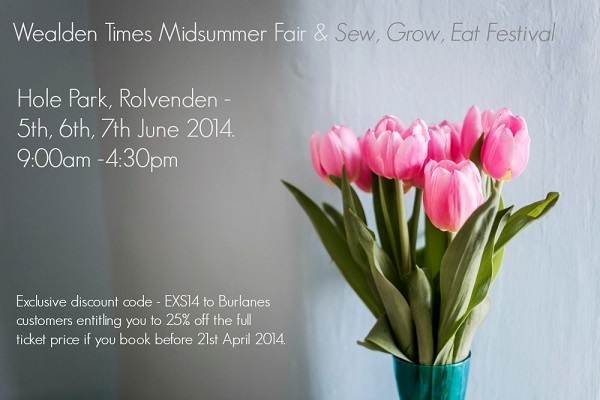 Book your e-tickets for the Wealden Times Midsummer Fair 5th-7th June before April 21st using the Burlanes discount code EXS14 and receive a 25% discount. Click here to download the Wealden Times Midsummer Fair flyer.